Fresh Guacamole with a Surprise Twist is hand-mixed guacamole with a squeeze of fresh orange juice. I love secret ingredients. They’re all over my blog: cardamom in my sweet yeast bread, chocolate in my chili, and ground cloves in my cinnamon rolls to name a few. They are usually in small amounts so the flavor is unrecognizable, but they add a distinctive touch. The secret ingredient in my guacamole is a squeeze of fresh orange juice, something I learned from Boudro’s, my favorite restaurant on the Riverwalk in San Antonio. 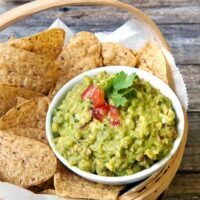 Guacamole is subject to personal tastes and family traditions much like meatloaf or potato salad. I like mine chunky (chunkier than shown above– it got a touch too much love in the whole mixing and picture-taking process) and relatively mild so the natural flavor of avocado can be appreciated. No raw onions for me! They are strictly prohibited in my guacamole. I get the ideal onion flavor from adding my favorite salsa which is almost any variety made by D.L. Jardines. Although commonly served as a dip with chips, I also like guacamole on sandwiches like a BLT or a Beefy Bean and Frito Burger, on toast (spread like jelly), or used as a condiment alongside other Mexican food. 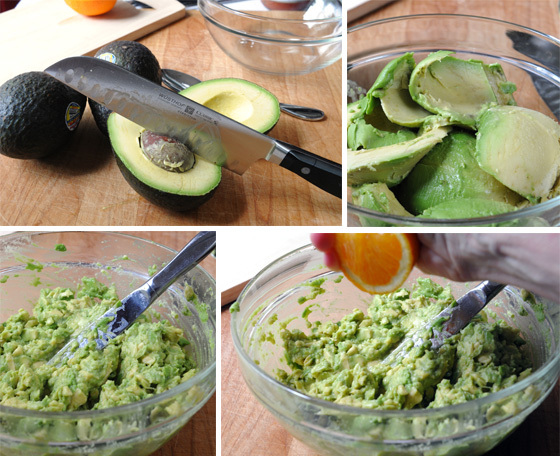 Remove seed, scoop out avocado flesh, chop with a knife and squeeze in fresh orange juice. Slice avocado lengthwise and split in half. Remove the flesh to a small bowl. Use a table knife to chop avocados until chunky. Mix in salsa and orange juice. Season with salt and pepper to taste. Garnish with chopped fresh tomatoes and cilantro if desired. Substitute lime or lemon juice for all or part of the orange juice for a more traditional guacamole. Just made this. It was really excellent. Topped it of with a beer of my choice. Thanks for the recepie! I just ate at Boudros and the guacamole was the best I’ve ever had…and I’ve had a lot of guacamole!!!! Do you have a similar recipe?? You have found my similar recipe. It is not THE recipe–just my attempt to get close. I do not like pico de gallo so I don’t add it but I know the restaurant does. I adore guacamole and will try your version; in Lebanon I might use bitter oranges which are used there a lot to make extracts and jams. This sounds very interesting, I’ll definitely have to try it! I usually make my own pico de gallo with roma tomatoes, sweet yellow onion (it’s much milder), tons of cilantro, fresh lime juice, a bit of kosher salt and some fresh-cracked pepper. Super-simple–I just mix that straight into my mashed avocado and make sure to add enough of the juice, which does help keep it from browning. I make enough pico to serve it separately from the guac for those who don’t care for avocado (though they’re crazy, I say). I couldn’t tell you how long it keeps in the fridge, because there’s never any left to put away! What great idea to add orange juice to the Guacamole. Oh. my. goodness!! I’ve had that guacamole at Boudro’s on the Riverwalk! Which is only interesting because I live North Carolina, not Texas. 🙂 It IS yummy! I will be printing off this recipe. I love guacamole and this looks like a winner! I became familiar with D. L. Jardines when we sold it in a store where I use to work. The Peach Salsa would fly off the shelf. Sandwiches? Yes. I love the Bacon avocado sandwich at Boo Boo’s but it has been years since I’ve had one. You have inspired me once again and the wheels are turning. I really appreciate you sharing your secret ingredient with us! Nothing like guacamole and chips! Will defiitely have to try the orange juice. Have used lemon and lime like everyone else has stated but not the orange. Love the Artisan Black Bean Chips by Tostitos too! My dear friend has a birthday in a couple of weeks and she LOVES Guacamole. We have a small group of 5 friends and we always have a birthday lunch together. I will make your recipe (with the secret ingredient) nice and chunky like you prefer, to share with everyone. Paula: No, I haven’t tried it because it never lasts that long! LOL! What a great sneaky twist! Have sometimes added orange zest into pork and onion ragu, but never thought about the juice in guac. Love it. Love the idea of the orange addition to the guacomole! The orange juice sounds fresh! I heard that if you store the guacomole, covered, with the pit buried inside, it won’t turn color so fast. I’ve heard that myself Gary. Have you tried it? Oooh, I like this idea! I was going to make guacamole tomorrow and I have oranges so I might give this a try. Thanks! OMG – love Boudro’s guac!! This recipe is clearly an adaptation–and not quite as much trouble for the home cook.